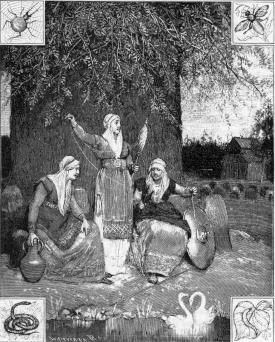 Norns are "the three old women who sit round a giant tree (see Yggdrasil) spinning men's fates, Urd (fate), Skuld (necessity) and Verdandi (being)." Also the name of a language which descended from old Norse, which was spoken in the Shetland and Orkney islands. The extinction of the language is believed to have come about during the 15th century, when the islands were ceded to Scotland, and the new government discouraged the language. Yggsdrasil was the World Tree, binding heaven, hell and earth. Geatland is another name for Gotland, an island which nowadays is in Sweden and Geats were the Scandinavian inhabitants of that island. According to Jordanes and modern archaeological finds, Geats are, in reality, the same as the Goths, or at least closely related. Jörmungand was a giant sea serpent that encircled Midgard, holding its tail in its mouth. One of the children of the trickster god, Loki. Mjollnir was Thor's hammer, used in combat and the cause of thunder. Niflheim is a region of darkness and cold - it is the lowest level of the universe, underneath Yggsdrasil's roots. Ragnarok is the Norse name for the battle in which all gods will die, along with all people (except Lif and Lifrasthir, who will restart all humankind). The sun will be eaten by the giant wolf Fenrir, and giants will go to war. It was said that it would be 'the end of the world'. "I do half expect a band of marauding Vikings to turn up any day now, asking for their myths back!" In 1993, Steve Grand wrote Small Furry Creatures: A Mythography, which detailed the mythos of Creatures, and caused confusion among the development team, which Steve tried to right with a later revisiting of the rationale for the mythos. The Fimbulwinter will be immediately before the end of the world, Ragnarok. The Fimbulwinter will be three winters in a row without any summers. Audmula was a supernatural cow, who emerged from the nothingness at the beginning of the world. She nourished the first frost giant with her milk, and licked Bor, the father of the Gods, out of primeval ice. This page was last modified on 18 August 2016, at 19:50.